Best of 2017: Top 21 Food Art Masterpieces of the Year – Sig Nordal, Jr.
December 27, 2017 December 27, 2017 Sig Nordal, Jr.
Food presentation has a long history, with records dating back to ancient Roman and Medieval times. In addition to enhancing aesthetic appeal, elaborate food presentation was thought to be a symbol of wealth, power, and cultural taste. More than 2,000 years later, food preparation has arguably evolved into a global food art movement. No longer reserved for high society banquets, 2017 has seen artists elevate day-to-day food and drink to a new level, crafting clever cuisine that’s almost too good to eat. We’ve seen some ingenious, highly expressive approaches emerge over the last year—exemplified by Dinara Kasko’s precise architectural cakes—as well as more traditional methods, but executed with a contemporary aesthetic, like Gothic black wedding cakes and frosted succulent-topped desserts. There’s also been a resurgence of time-honored techniques applied to the humble pie and cake—from Karin Pfeiff Boschek’s perfect pastry crusts to Maggie Austin’s floral sugar flowers. This year’s list makes an excellent case for why you should always play with your food. Check out our top 20 food art masterpieces from 2017. Ballerina-turned-pastry chef Maggie Austin uses various techniques to create delicate, super-realistic flowers made out of sugar. Arranged atop of multi-tiered cakes, they look far too beautiful to eat. Using all-natural ingredients and a toothpick, Rachel Lorton produces smoothie bowls in colorful, vibrant patterns. They not only look amazing, but they’re healthy, too. Lorton’s ingredients include raw beetroot, turmeric, hemp heart, pea flower, and more. Nisnas Industries partnered with Tamtik Chocolate to create a series of chocolate blocks in the shape of city maps from across the globe. Each design takes inspiration from mashrabiya, a traditional geometric Arabic pattern, typically found in architecture. Architect-turned-pastry chef Dinara Kasko designs a diverse collection of sculptural desserts, rendered using algorithmic tools and complex diagramming techniques. 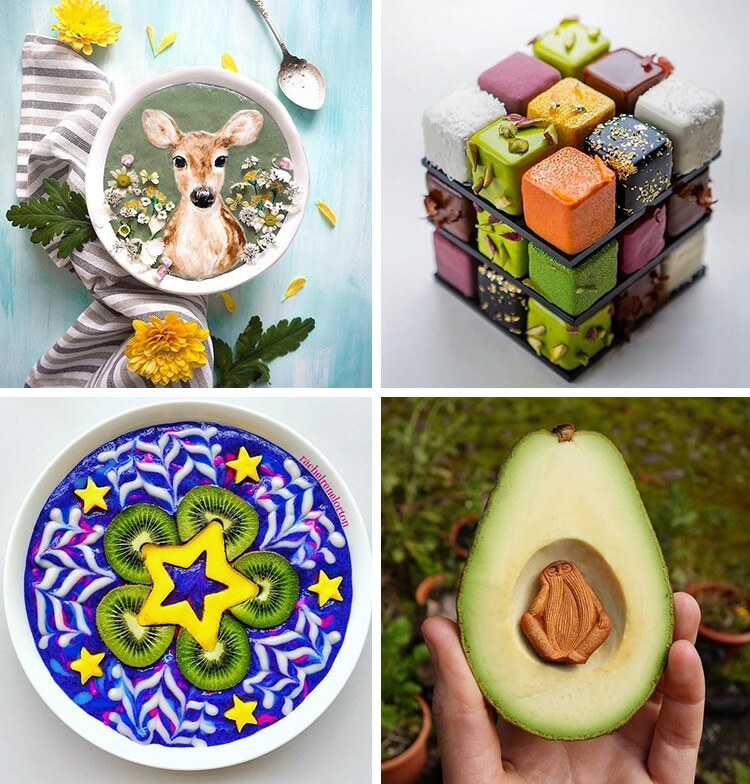 Hazel Zakariya uses smoothie bowls as her canvas, and natural ingredients—like turmeric, blue matcha, and activated charcoal—as her “paint.” Her culinary creations depict adorable animals and characters from popular culture. Dubbed the “Lady Gaga of Food,” Linda Miller Nicholson has a reputation for making avant-garde edibles. Her homemade, naturally-dyed pasta comes in an amazing array of rainbow colors, shapes, and designs. 17-year-old Singapore-based latte artist Daphne Tan uses a foamy mix of carob powder, soy milk, and water to create thick, sculpted foam characters that pop out of the mug. Self-taught baker Raymond Tan produces delectable cakes pops that really pop with color and festive design. His creations range from elegant and abstract patterns to super cute characters. This food artist creates perfectly patterned pies from her home-made pastry. From geometric patterns, to nature-inspired motifs, her pre- and-post-oven images on Instagram are a masterclass in pastry decoration. Using a toothpick, a spoon, and a miniature piping bag made from parchment paper as her tools, Eiko Mori creates charming patterned motifs on shoku-pan, a Japanese-style milk bread. 2017 saw many non-traditionalist couples favoring gothic wedding cakes for their special day. Dark icing acts as a dramatic backdrop for eye-catching accents like delicate sugar flowers and hand-painted gold designs. This Moscow-based bakery creates edible artworks that feature one of art’s most fundamental elements: the brushstroke. The painterly chocolate strips are airbrushed in a range of colors, and artistically arranged on the cakes. Rachel Dyke merges food art and miniaturization to create tiny cake towers that can fit in the palm of your hand. But don’t be too quick to bite—the creations are made of an inedible polymer clay. Jakarta-based Ivenoven uses her perfect piping techniques to create gorgeous, mouth-watering succulent cakes sculpted with frosting, butter, and food coloring. Los Angeles-based artist Holly Fox‘s colorful cookies are baked in a range of quirky motifs and colors, from vintage sewing machines and nail polish bottles to unicorns and seahorses. Culinary artist Cédric Grolet transforms the famous hand-held puzzle into a cube-shaped assortment of 27 individual pastries. Food artist Melly Eats World takes minimalist French macarons in a whole new direction with her adorable animal versions. Featuring pandas, pigs, monkeys, and cats, if you flip the pastries over you’ll find their tails. In a collaboration between International ad agency I & S BBDO and the Umino Seaweed, the Design Nori collection of laser-cut seaweed comes in five designs. Each features a different motif from Japanese history or symbology. This barista uses latte foam to create what he calls cremart. Kangbin Lee delicately adds a variety of drinkable, colored pigments to the foam to create portraits of Disney characters, flowers, and animals, as well as recreations of famous masterpieces such as Van Gogh‘s Starry Night. Another big trend we noticed this year was floral cakes. Made mostly from sweet buttercream, creations range from spectacular bouquets to minimalist arrangements set atop cakes and cupcakes. The post Best of 2017: Top 21 Food Art Masterpieces of the Year appeared first on My Modern Met. Previous Article Everyone faces difficulties. Difficulties mean opportunities: Rebuild! Next Article Why talk about Trump and 2020 in the same sentence? The world will not survive this presidency, let alone if Trump stays until 2024.